A couple of days ago I was talking to my husband about something that happened a few years ago and I said “yeah you know, that was something we used to do before our life stopped”. He knew exactly what I meant, but he corrected me “you mean, paused”. He looked at me as to say: it won’t be like this forever. His reaction made me wonder. Does your life pause or change when you have under 5s? Depending on your point of view you will certainly have a different ride as a parent. If you believe, like us, that your life pauses for 4 or 5 years when you have kids, you’ll probably struggle. You definitely won’t have any more children! Like us. I don’t even remember last time I had breakfast without someone trying to steal it or asking me to change a dirty nappy! When your toddler screams for 70 minutes on a 75 minutes journey and then wakes up the other and they screamed together for the rest of the journey… can you really appreciate parenthood? Some days are really bad, some others start badly but end up great. What I still struggle with after 2 years is the crying. The long uninterrupted crying. Despite not being newborns, the boys still cry every single day. 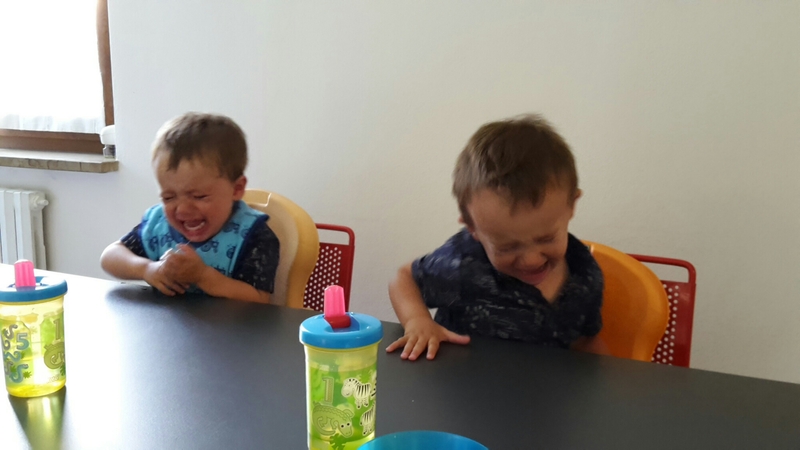 Twins cry much more than single children as they have more to “complain” about. For example they would cry “in stereo” when they both want mummy to take them upstairs or feed them breakfast. Or one would cry when the other twin steal his favorite toy. And most importantly one would scream when his twin is wearing something he want at all cost. This accumulate to a lot of crying… every… single… day! Some of those days all you need is a break… but do you know the hardest thing about being a parent? There are NO breaks!